Unicellular green algae form symbioses with marine invertebrates, ciliates, fungi, flowering plants, and vertebrates (including humans and salamanders)! Read more below about our two main projects on symbiotic green algae. Green algae are symbiotic with spotted salamanders and other amphibians. Some of the microscopic green algae associated with salamander eggs. 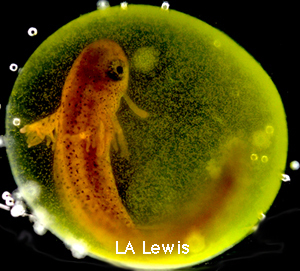 Currently I am collaborating with Mark Urban (EEB, Uconn), Kurt Schwenk (EEB, Uconn) and Tobias Landberg (Arcadia University) on the green algae of salamander eggs. Undergraduate students also have been involved, including Andrew Fuller and Crystal Xue. We are using molecular data to uncover the diversity of algae that form symbiotic relationships with spotted salamanders. Some of the algae that we have discovered living with salamanders in the egg stage are shown. 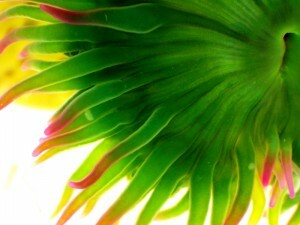 In the north Pacific, the green sea anemones (Anthopleura elegantissima and A. xanthogrammica) form associations with green algae and dinoflagellates. Right now we’re working to understand the evolution of the symbiotic algae’s chloroplast and mitochondrial genomes, a project in connection with former student Molly Letsch. Letsch, M.R. and L.A. Lewis (2012) Four gene arrangements within the chloroplast genome of a closely related group of green algae (Trebouxiophyceae, Chlorophyta). Molecular Phylogenetics and Evolution 64: 524–532. 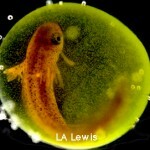 Letsch, M.R., G. Muller-Parker, T. Friedl, and L.A. Lewis (2009) Elliptochloris marina n.sp. (Trebouxiophyceae, Chlorophyta), green symbiont of Anthopleura xanthogrammica and A. elegantissima (Anthozoa, Cnidaria). Journal of Phycology 45: 1127-1135.